In reflecting on the ways Eugene Peterson shaped my pastoral ministry after his passing (see “Remembering Eugene Peterson“) on Monday, October 22, I took a look through his writings again. I asked myself a number of questions, amongst them being: what was it about Peterson that helped me so greatly as a pastor? I saw a note in one book saying that I re-read Five Smooth Stones for Pastoral Work in August 2016. I remember receiving that book like a glass of cool water on a hot day right when I needed it. Part of what made his words in that book so refreshing was the way in which he opened up Scripture so powerfully and clearly with application to pastoral ministry today. As I continued peaking through the pages of his writing on pastoral ministry, I was quickly sucked in by the first few pages of Working the Angles: The Shape of Pastoral Integrity. This book, published in 1987, strikes a chord so relevant for our own day. I will share the extended excerpt that caught my attention below, but over the next few weeks, I will share some reflections on this outstanding book. I hope you benefit from it as much as I do. American pastors are abandoning their posts, left and right, and at an alarming rate. They are not leaving their churches and getting other jobs. Congregations still pay their salaries. Their names remain on the church stationery and they continue to appear in pulpits on Sundays. But they are abandoning their posts, their calling. They have gone whoring after other gods. What they do with their time under the guise of pastoral ministry hasn’t the remotest connection with what the church’s pastors have done for most of twenty centuries. Working the Angles: The Shape of Pastoral Integrity (Grand Rapids, MI: Eerdmans, 1987), pp. 1-2. As I read those first two pages of the book, it was as if I were reading so much of my own story, and the story of so many other pastors, as we wrestle to hold onto our vocation in a culture and church culture that seems many times dead-set on forcing us to let it go of it. Throughout the rest of the book Peterson works out how the pastor can hold onto appropriate biblical vocation through three “angles” of prayer, Scripture, and spiritual direction. More to come on that in future posts, but perhaps now is a good time to consider whether we have abandoned our post — our pastoral calling — as pastors in North America. When I do premarital counseling with couples, one exercise I always have them do is called the wish list. Each person must identify three things they wish happened more or less in their relationship, and then share that with one another. While one person is speaking, the other person has to listen without making a judgment on these statements. Then, they have to repeat back what the other person said to insure that they have really listened. It’s harder than you might think. 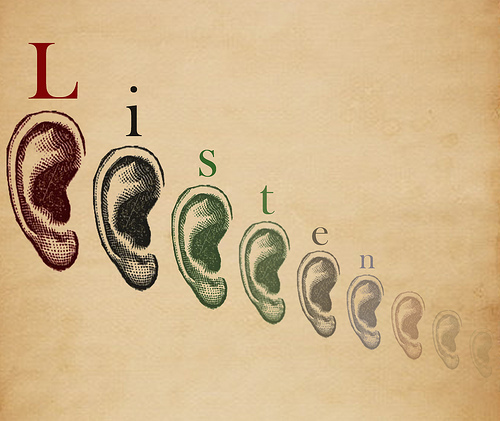 It’s one thing to let the words make their way into your ears, but it’s another thing to truly listen to another person.